Background: Facial aging is characterized by skin changes, sagging and volume loss. Volume is frequently addressed with reabsorbable fillers like hyaluronic acid gels. 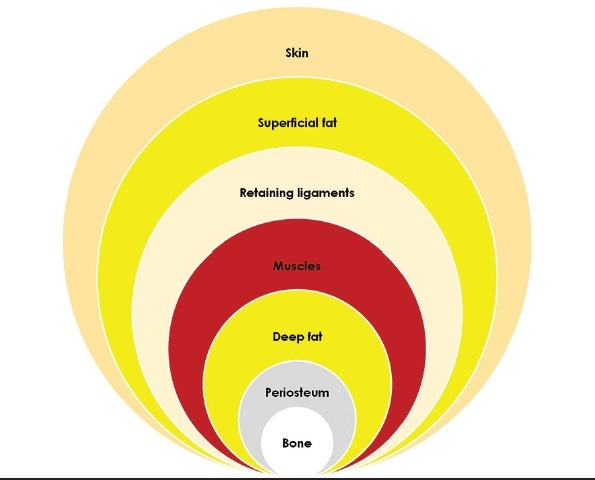 Materials and Methods: From an anatomical point of view, the deep and superficial fat compartments evolve differently with aging in a rather predictable manner. Volume can therefore be restored following a technique based on restoring first the deep volumes and there after the superficial volumes. We called this strategy "dual plane". A series of 147 consecutive patients have been treated with fillers using the dual plane technique in the last five years. Results: An average of 4.25 session per patient has been carried out for a total of 625 treatment sessions. The average total amount of products used has been 12 ml per patient with an average amount per session of 3.75 ml. We had few and limited adverse events with this technique. Conclusion: The dual plane technique is an injection technique based on anatomical logics. Different types of products can be used according to the plane of injection and their rheology in order to obtain a natural result and few side effects. Context: Hyaluronic acid (HA) is the most common filler used to rejuvenate. 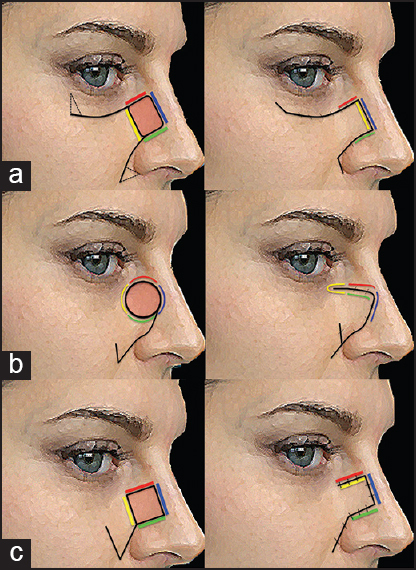 Today, a three-dimensional approach prevails over previous techniques in which this material was used in specific areas of the face such as the nasolabial fold, the marionette line, and the eye trough giving a strange appearance that does not look natural. Even with a volumizing purpose, the injection of HA can sometimes produce clinically detectable nodules or lumps where the filler is deposited. Aims: To develop a new technique of injecting HA that can provide more natural results and avoid the lumpiness and nodular appearance that sometimes occurs with the injection of HA. To detect whether mixing HA with diluted anesthetic agent modifies its behavior. Settings and Design: Prospective, case control, single-center study on a private clinic setting. Materials and Methods: Eighty six patients were enrolled in this study. All of them had a previous treatment with nondiluted HA using a needle at least a year before. 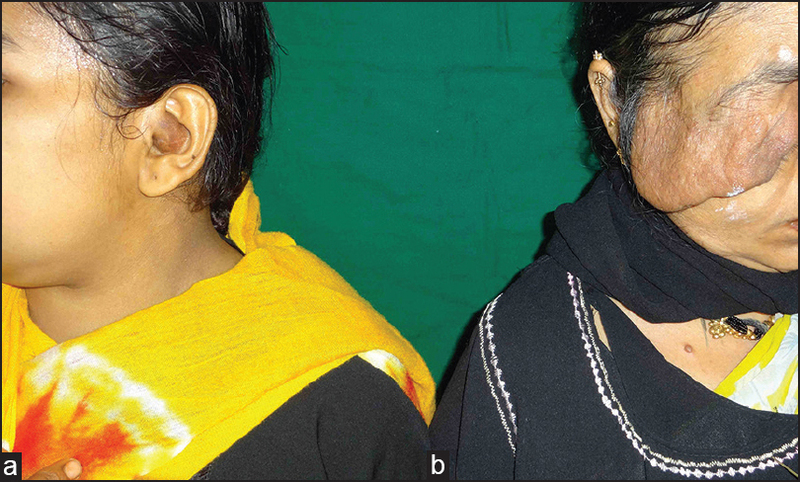 Patients were injected with 8 mL of reticulated HA (RHA) mixed with 6 mL of saline and 2 mL of anesthetic agent. The mixture was administered through a cannula inserted in the face, one at mid-cheek and another at frontal-temporal point of entry. Owing to the lifting effect of this mixture we called this procedure liquid lift (LL). Patients were evaluated 1 month, 6 months, and a year later and asked to compare the LL with previous experiences in terms of natural look, pain, and appearance of nodules. Statistical Analysis Used: Student's t-test. Results: One month after the treatment, 83 out of 86 patients (96.5%) thought LL produced a more natural look than the previous treatment with the needle. Sixty two (72%) considered LL less painful than the previous treatment and only eight (9.3%) could detect lumps or nodules 1 month after LL was performed compared with 46 (53.5%) that described this problem with previous needle injections. The incidence of bruising was also clearly lower (7% with LL vs 17.4% with traditional needle). Conclusions: Injection of diluted HA with saline and anesthetic agents through a cannula all over the face or LL can provide more natural results and less lumps or nodules, and is less painful than traditional treatments involving needle injection of nondiluted HA. The lips and the eyes enhance facial beauty, and they have been highlighted since time immemorial. Rejuvenating the lips with fillers, frequently hyaluronic acid (HA), is a common procedure but requires expertise. The objective of this text is to describe the procedure in detail and cover the practical aspects of injecting lips with fillers. An analysis of treating lips with needles and cannulae has been made with special emphasis on achieving optimum results. Background: Topical anaesthetics are effective for patients undergoing superficial dermatological and laser procedures. Our objective was to compare the efficacy and patient preference of three commonly used topical anaesthetics: (2.5% lidocaine/2.5% prilocaine cream (EMLA ® ), 4% tetracaine gel (Ametop TM ) and 4% liposomal lidocaine gel (LMX4 ® )) in patients undergoing laser procedures and skin microneedling. 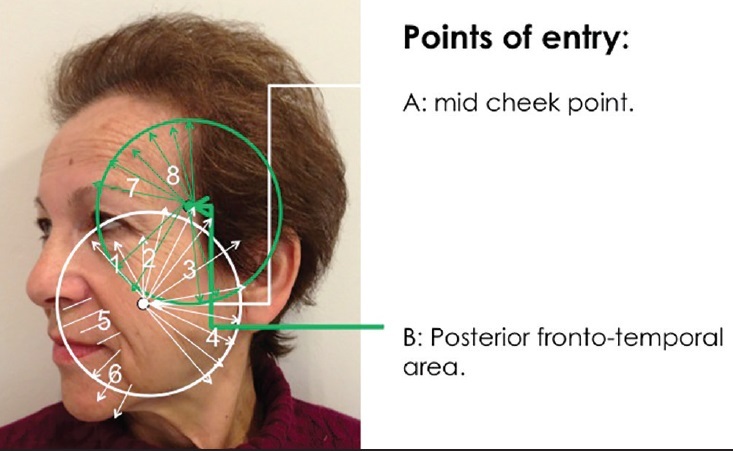 Settings and Design: This was a prospective, double-blind study of patients undergoing laser and skin microneedling procedures at a laser unit in a tertiary referral dermatology centre. 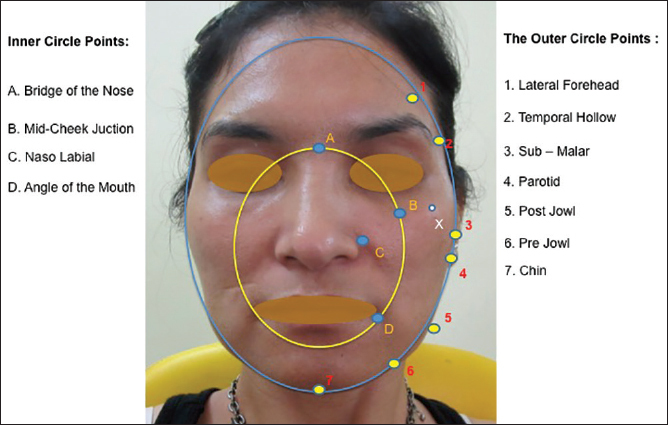 Materials and Methods: All 29 patients had three topical anaesthetics applied under occlusion for 1 hour prior to the procedure, at different treatment sites within the same anatomical zone. A self-assessment numerical pain rating scale was given to each patient to rate the pain during the procedure and each patient was asked to specify their preferred choice of topical anaesthetic at the end of the procedure. Statistical Analysis: Parametric data (mean pain scores and frequency of topical anaesthetic agent of choice) were compared using the paired samples t-test. A P-value of ≤0.05 was considered as statistically significant. Results and Conclusions: Patients reported a mean (±SD; 95% confidence interval) pain score of 5 (±2.58; 3.66-6.46) with Ametop TM , 4.38 (±2.53; 2.64-4.89) with EMLA ® and 3.91 (±1.95; 2.65-4.76) with LMX4 ® . There was no statistically significant difference in pain scores between the different topical anaesthetics. The majority of patients preferred LMX4 ® as their choice of topical anaesthetic for dermatological laser and skin microneedling procedures. 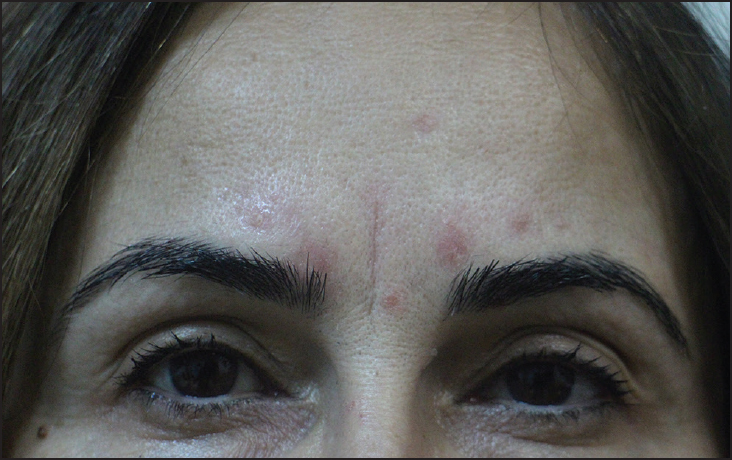 Background and Objectives: Post-acne scarring is a common and well-known sequelae of acne vulgaris. We aim to study the impact of post-acne scarring on the quality of life (QOL) among young adults in Singapore. Settings and Design: This was a non-interventional prospective study. Materials and Methods: Patients aged 21-40 years with atrophic and hypertrophic acne scars who attended the National Skin Centre, Singapore were recruited in the study. 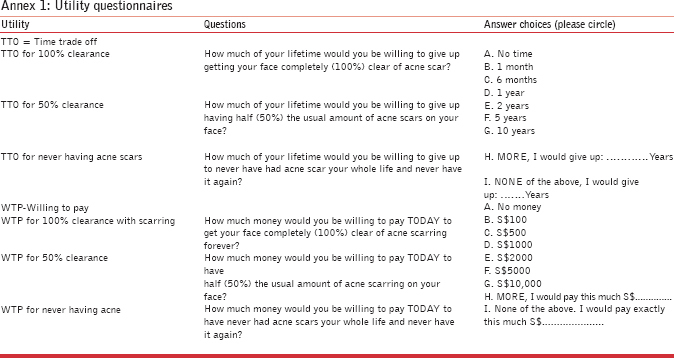 They answered a simple questionnaire and the clinical severity of their acne scars were assessed by the doctor. Statistical Analysis Used: Descriptive analyses using absolute and percentage frequencies were performed on all data. The test of significance was two-sided and was set at 5% (P ≤ 0.05). Differential analyses were conducted using the parametric, independent two-sample t-test and non-parametric Mann-Whitney U-test. The statistical assessments were performed using SPSS version 18.0. Results: A total of 100 patients were studied. The mean patients' subjective self-scoring on the severity of their post-acne scars was 5.78/10 and the mean Dermatology Life Quality Index (DLQI) for post-acne scars was 5.61. Many (36%, n = 36) were self-conscious of their acne scars and 24%, (n = 24) felt that their acne scars was affecting their social activities. Conclusions: Our study showed that post-acne scars have a significant negative effect on the QOL of young adults. It highlights the need to increase public awareness of acne vulgaris and its sequelae through education programs and advocating early treatment to reduce the risk of scarring. Background: Fractional photothermolysis is one of the most effective treatment options used to resurface scars of different aetiologies. 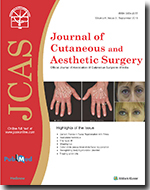 Aim: To assess the efficacy and safety of fractional CO 2 laser resurfacing treatment in the management of non-hypertrophic traumatic and burn scars. 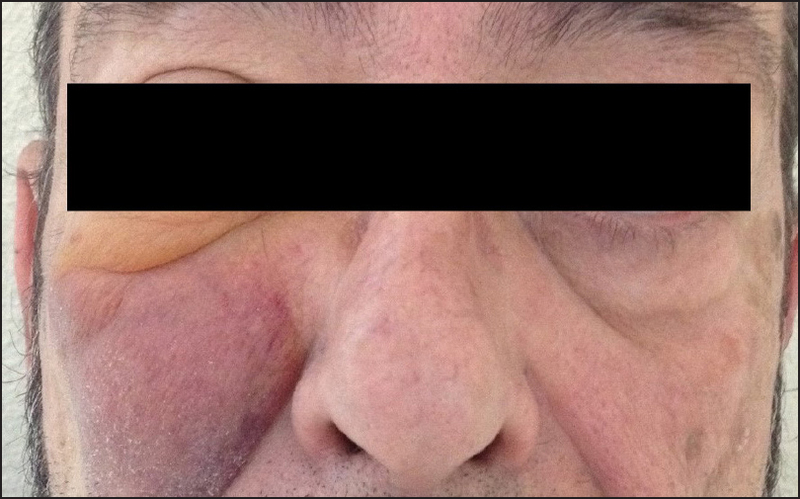 Materials and Methods: Twenty-five patients affected by non-hypertrophic traumatic and burn scars were treated with four sessions of fractional CO 2 laser resurfacing treatment at 6-weekly intervals. Patients were photographed at each visit and finally, 3 months after the end of treatment schedule. Response to treatment was assessed clinically as well as by comparing the initial photograph of the patient with the one taken at the last follow-up visit 3-months after the final treatment session. Changes in skin texture, surface irregularity and pigmentation were assessed on a quartile grading scale and scored individually from 0 to 4. A mean of the three individual scores was calculated and the response was labelled as 'excellent' if the mean score achieved was >2. A score of 1-2 was labeled as good response while a score below 1 was labeled as 'poor' response. The subjective satisfaction of each patient with the treatment offered was also assessed at the last follow-up visit. Results: The commonest site of scarring treated was the face followed by hands. Response to treatment was rated as excellent in 60% (15/25) patients while 24% (6/25) and 16% (4/25) patients were labeled as good and poor responders, respectively. Skin texture showed better response than other variables with average score of 2.44. Linear post-traumatic scars were seen to respond less than other morphological types. Majority of the patients (19 out of 25) were highly satisfied with the treatment offered. No long-term adverse effects were noted in any patient. Conclusions: Fractional photothermolysis with a fractional CO 2 laser gives excellent results in patients with post-burn scars with minimal adverse effects. Limitations: Lack of a control group and small sample size are limitations of this study. Dysmorphophobia is a psychiatric condition which frequently presents in the clinics of dermatologists and plastic surgeons. This disorder (also called body dysmorphic disorder) is troublesome to the patient whilst being confusing for the doctor. This commonly undiagnosed condition can be detected by a few simple steps. Timely referral to a psychiatrist benefits most patients suffering from it. This article describes with a case vignette, how to recognize body dysmorphic disorder presenting in the dermatological or aesthetic surgery set up. Diagnostic criteria, eitiology, approach to patient, management strategy and when to refer are important learning points. The importance of recognizing this disorder timely and referring the patient to the psychiatrist for appropriate treatment is crucial.This article covers all aspects of body dysmorphic disorder relevant to dermatologists and plastic surgeons and hopes to be useful in a better understanding of this disorder. Introduction: An oval face, pronounced cheek bones, a defined jaw line and a smooth Ogee curve are global aesthetic beauty goals. Though criteria are similar the Indian face poses some unique challenges because of the innate differences in skeletal shape, size, and soft tissue disposition. 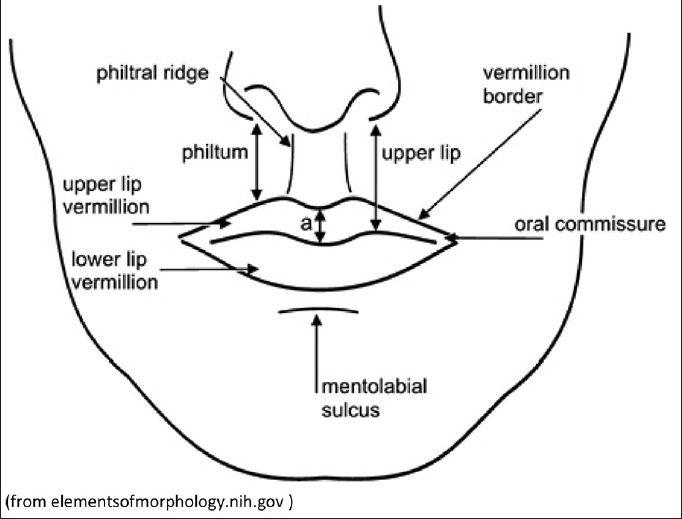 Width of the malar prominences and mandibular angles along with height are smaller compared to the other Asian and Caucasian populations along with a much heavier soft tissue disposition. This creates unique deficits and places unique demands on aesthetic intervention. Objectives: The evolution of practice patterns has lead to a variety of newer approaches; however, it is still common to target the nasolabial and mid-face volumizing as basic intervention for facial beautifying and rejuvenation. As aging progresses, Indian faces tend to get fuller and the tissue then descends downwards similar to other ethnic groups albeit more aggressive due to higher volumes of facial fat pad and smaller bone framework. Any excess correction in the inner circle zones will further add to the bulk along with cumulative remnants of previously administered fillers. Methods: In a younger face when the goal is beautification the attempt is to address the specific structural deficit on the outer bony framework along with the chin. This enhances the appearance immediately as well as holds up the tissue descent as they age. When the goal is youthful transition of an aging face, then again the bony changes further enhance the deficit in framework and the loss of fat pads along the periphery that is lateral forehead, temples and lateral cheek. Fat pad correction will give the most natural and best results as against working on the anterior mid cheek, nasolabials and angle of the mouth in a soft tissue heavy center zone of the face. Botulinum toxin and hyaluronic acid (HA) fillers remain the most popular facial injectables used for facial rejuvenation and structural enhancement. Results: Naturally enhanced faces, and gracefully addressed aging changes are important. Fillers administered on the outer zones of the face rather than the inner zone gives better aesthetic results. Dumbbell-shaped swellings in neurofibroma have been commonly described in the spine, thorax, cranial cavity, and pelvis; however, dumbbell-shaped swellings in the peripheries are rare. Here, we report a dumbbell-shaped neurofibroma over the pinna in an 18-year-old female patient, its successful surgical management, and its association with Hashimoto thyroiditis. To the best of our knowledge, this is the first ever case to be reported of a dumbbell-shaped neurofibroma over the external ear and only the fourth case of neurofibromatosis type 1 (NF1) to be associated with Hashimoto thyroiditis.